These little pockets are a meal in themselves and just as perfect for a cozy evening at home as they are for a meal on the go. You could – and should – make some extras to freeze and reheat later. Chard is still growing in my garden, which is why I chose it here, but use whatever greens you have on hand. Kale and spinach would work well. 2. Drizzle a little olive oil in a medium pan, then add in shallots and garlic. When shallots are soft, toss in chard and sauté til wilted. 3. Combine veggies, chicken and cheese. 4. On floured surface, roll out each ball of dough as thin as possible, then cut into quarters. 5. 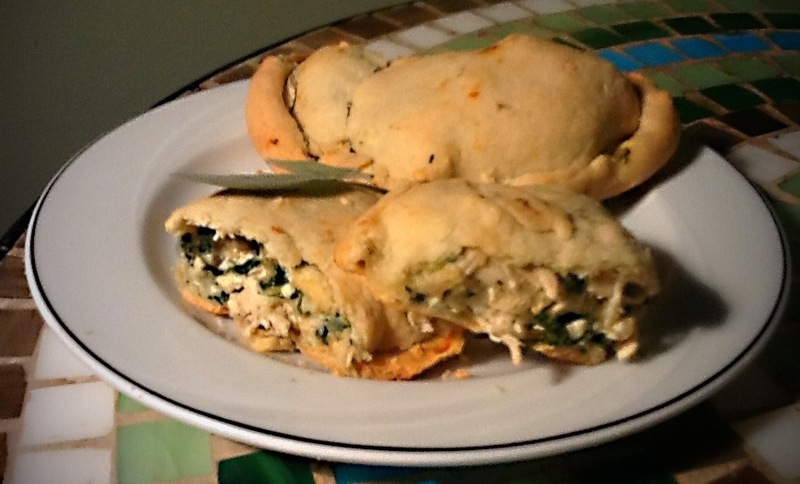 Divide the chicken mixture into eighths, then spoon one portion into the corner of each square of dough. Fold each square in half diagonally to form a triangular pocket. Using wet fingers, pinch edges closed. 6. Carefully place pockets on a greased baking sheet and bake til golden brown – about 12-15 minutes.